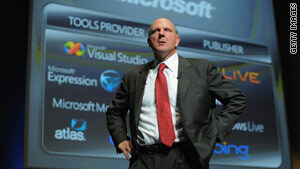 The New York Times is reporting that Microsoft's Steve Ballmer will announce a computer tablet at CES. Las Vegas, Nevada (CNN) -- Will Microsoft beat Apple to the punch in announcing a touch-screen "tablet" computer? That's the latest rumor at this year's Consumer Electronics Show, the largest consumer tech trade show of the year. Microsoft CEO Steve Ballmer is expected to announce Wednesday night in his keynote address here that his company will launch a touch-screen tablet computer with computer maker Hewlett-Packard, according to a New York Times report that cites anonymous sources familiar with the announcement. There's no way to know for sure what Ballmer will say, of course. Microsoft has not confirmed the report. And Computer World reports that HP is not ready to get into the tablet fray. "Hewlett-Packard Co. may be the biggest champion of touch computing, but even HP is not ready to embrace the hype and ship a full-fledged tablet computer," Eric Lai writes on Computer World's Web site. If Microsoft does announce a tablet computer, it will be seen by the tech community as a direct taunt to Apple, which is also rumored to be planning a much-anticipated tablet announcement later this month. "This product better be good because Apple is expected to unveil its take on the slate/tablet form factor later this month. If history holds, Apple will issue a product that surprises people in a few ways and that stands out from the crowd," writes the Times' Ashlee Vance. "So the last thing Mr. Ballmer wants to hold up is a me-too device." Tablet computers combine elements of smartphones, like Apple's iPhone, e-book readers, like the Amazon Kindle, and traditional laptops. Most tablets have touch screens and look somewhat like a giant iPhone. They could be used to read books and surf the Web. On Tuesday night at CES, Lenovo demonstrated its new IdeaPad U1 Hybrid tablet, which has a detachable touch screen so that it can work as a standard netbook, too. Members of the media swarmed Lenovo's booth at the media-only event. But, despite the buzz generated by the upcoming tablet category, there are some doubts about its future success or necessity.